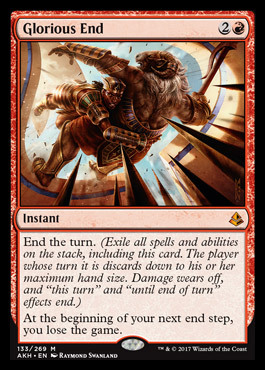 I have no idea if this card is playable or not, in any constructed or limited format, but it is completely awesome. @Snafu, here's Final Fortune 13-16 for your Gideon deck. Could this get slotted into Belcher? I feel like comboing this with day's undoing would be snazzy. This is much better than final fortune because you get to exile all spells on the stack, wait for your opponents creatures to tap out, or do it in response to your own death. Having said all that, the card is still pretty much garbage. @gkraigher Why are you telling me this? Does "damage wears off" mean that you take no damage this turn, or this phase? Not familiar with the terminology for "wears off." Damage wears off is specifically referring to damage on creatures each turn. Wears off means they reset and don't carry over to the next player's turn. Normally damage wears off during the cleanup phase, however that step is being skipped by the card. Damage wears off is specifically referring to damage on creates each turn. Wears off means they reset and don't carry over to the next player's turn. The card literally says "damage wears off" in the reminder text.